When we think about clutter, we usually think about the piles of boxes, papers and random miscellany filling the odd and rarely used corners of our homes. But clutter can hide just as easily in boxes, behind cabinet doors and even in everyday plain sight. Jewelry, for example, can become a massive tangled monster if not properly taken care of and cleared out on occasion. There are several ways to begin taming your (or in my case, my wife's) bauble beast. No matter what sorting method you choose, the best way to start is by acknowledging that some items will just have to go. It doesn't have to be all at once. In fact, this method allows you to take a long term approach that not only helps eliminate more clutter than you would in a fast cleaning fury, it will help you confidently identify and keep the pieces you truly love. Most of the time, jewelry isn't just in one place. It's scattered throughout the house in boxes and drawers, on hangars and in bags. That's another reason why jewelry can become such an insidious clutter issue. It tucks itself into innocuous places and before you know it, earrings are turning up in car cup holders and bracelets are spilling out of handbags. The first thing to do is gather it all in one place. The second is to begin sorting. To sort, make sure you have three boxes available to dedicate to this project. Shoeboxes usually work best. Start by gradually sorting your jewelry into a "favorites" box, a "like it" box and an "iffy" box. Once you're done, stack your "like it" and "iffy" boxes somewhere you can easily get to, such as under the bathroom sink or in a towel closet. By making them accessible, you allow for simpler and less time-consuming future sorting. Now that you've identified your favorites, you should be able to access them easily. Making them highly visible also serves to remind you of what you have available. There are a number of approaches you could use to display your items, from corkboards to jewelry hangars to decorating former screened windows. One creative method involves repurposing an old CD rack. If you have one of those old wire racks with wooden ends, or if you come across one at a yard sale or thrift store, you can turn it into a jewelry display piece in almost no time. Simply grab some small screw hooks from your local hardware store and screw as many of the hooks as you like into the bottom of the top wood piece. You can hang your necklaces from these and use the wire rack to hold your earrings and bracelets. Need more necklace hangars? Just add a couple decorative "s" hooks to the wire rack for instant additional hangars. Your favorite pieces are available and you can easily get to the rest. Let the gradual cleaning process begin. Before you start, however, be sure to mark your calendar exactly six months from the date you began sorting as the day to make your final sorting decisions. Over the next six months, move your jewelry pieces around as necessary. If you really like one necklace and never end up wearing it, move it down to the "like" box. Did a set of earrings look odd on its own but end up pairing well with a bunch of outfits? Move it out of the "iffy" box and up to "like" or "favorites." By allowing this length of time, you can account for changes in tastes, styles and even the weather. At the end of six months, you'll have a much better assessment of what you really like and what you will truly feel comfortable letting go of. Getting rid of your "iffy" jewelry items doesn't mean just tossing them out. You can donate them to a reputable, charitable thrift store or make a few dollars by consigning them. You might even be able to sell them individually or in sets through online buy and sell sites. Still have a lot of lingering items? You can choose to continue the process another six months and get rid of additional pieces in your "like" box. This six month process doesn't just have to work for jewelry. It can be used on clothes, kitchen items, craft rooms and any other area in your home that might be getting a little too cluttered. What types of clutter would you get rid of with this plan? 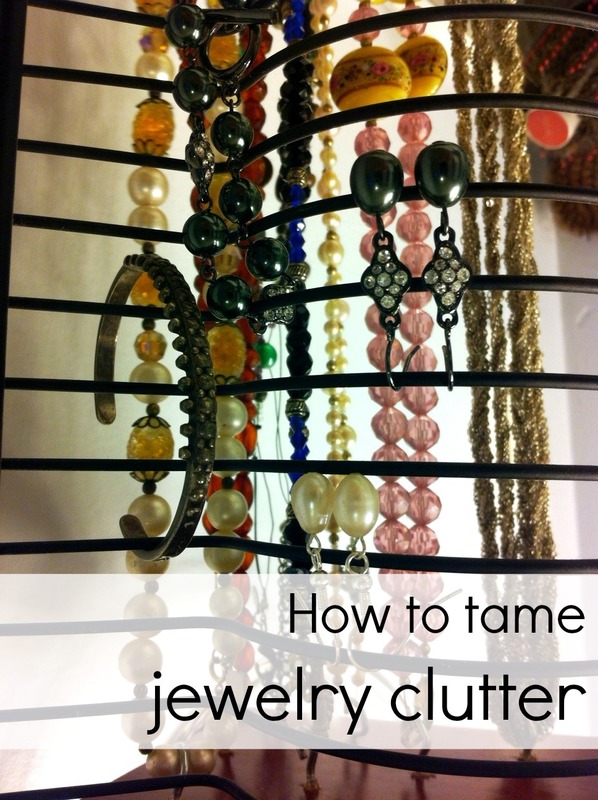 Do you have other fun ways of displaying your favorite jewelry items? As a key member of the team at Extra Space Storage, Tim Eyre helps customers care for their cherished belongings that must be put in storage. Tim regularly visits his facilities including Dallas Storage Units. Thanks for sharing those great tips Tim! How do you organize your jewelry!? My bracelets and necklaces needs taming. I liked your idea and suggestions. I will try it at my home. It feels good when all the jewelries are arranged perfectly.